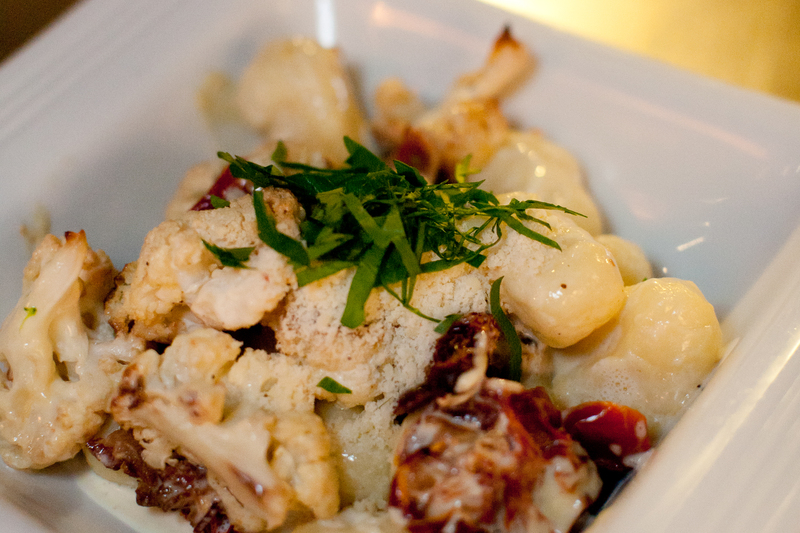 Gnocchi Bar's cauliflower-sun dried tomato gnocchi. Photo courtesy of Jackie Donnelly. Gnocchi is the ultimate comfort food. When properly made, these pillow-soft Italian dumplings will warm your tummy, and soothe your soul. Although their origins are Italian, there are versions of gnocchi in many European countries, especially those nearby, like Austria, and Germany. In Italy, regional variations exist, such as the Gnocchi Alla Romana, made with semolina, and formed into large disks, then baked in the oven and topped with a little grated cheese. The result is more like polenta than dumplings, but it’s tasty all the same. I prefer the northern style, which is made by forming a delicate dough from flour and potatoes, often with the addition of eggs or cheese. The dough is gently formed into cylinders, which are cut into thumb-sized pieces, then rolled against the back of a fork, or a gnocchi board to create those little ridges that trap a delicious sauce. After spending a few minutes in gently boiling water, they can be finished with a sauce of butter, cheese and herbs, cream, or other ingredients of your choice. If you haven’t tried your hand at home-made gnocchi, here’s a simple recipe from Epicurious for gnocchi made with russet potatoes. Here in Seattle, we have a resident gnocchi evangelist in Lisa Nakamura, whose casual dining concept, Gnocchi Bar has evolved into a wholesale operation that aims to satisfy all of our local gnocchi cravings. Lisa’s handcrafted gnocchi are delicate and delightful and they will leave you with a smile on your face.